During the Prohibition Era, speak easy establishments circumvented the strict liquor laws by selling tickets to 'see a blind tiger in the back room', and throwing in a complimentary gin cocktail. Deluxe Distilleries celebrates the creativity of yesteryear with this contemporary, raw, unique, and handcrafted Blind Tiger Gin. 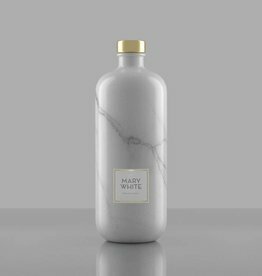 Distilled in small batches in the back room of a concealed distillery in the Western part of Belgium, unusual botanicals such as malted barley and cubeb pepper are used to give Blind Tiger Gin its daring and invigorating character. you'll be roaring for more. 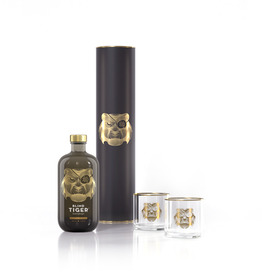 De giftpack bestaat uit 1 fles Bind Tiger Imperial Secrets 50cl en 2 originele glazen, verpakt in een luxe koker. Wie op zoek is naar het ideale geschenk kan opgelucht ademhalen! 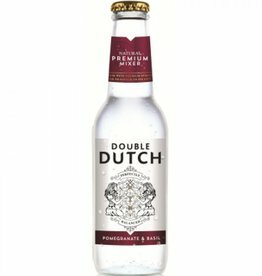 Deluxe Distillery Double Dutch 4 pomegranate & basil mixers 200 ml. Double Dutch 4 pomegranate & basil mixers 200 ml.